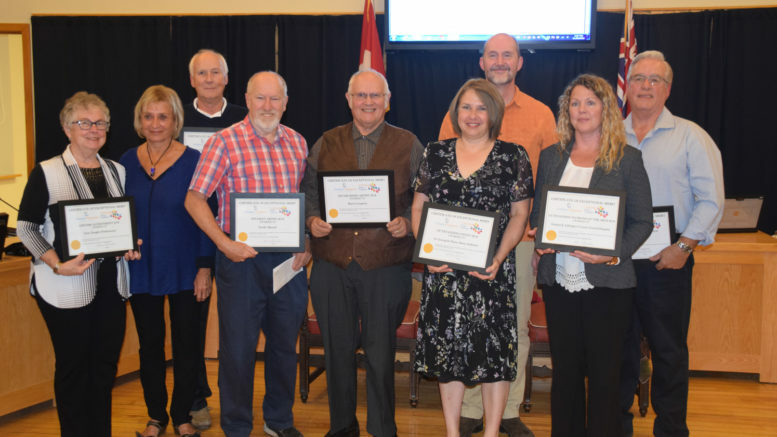 The 2018 Municipal Arts and Culture Award winners were (from left) Mary Doughty, (accepting on behalf of her late husband Ernie), Viola Kalinowski, Dave Anderson, Cliff Trott (accepting on behalf of Noelle Maracle), Barry Lovegrove, Stacey Anderson, Martin Barstow, Michelle Smith and Jim Wood. Photo by Adam Prudhomme. A spotlight was shone on Greater Napanee’s vibrant arts and culture scene during Tuesday’s town council meeting as the 2018 Municipal Arts and Culture Awards winners were honoured. Tim Nimigan of the Arts and Culture Advisory Committee of Greater Napanee, along with deputy mayor and council chair Marg Isbester read a short blurb about each recipient, who was then presented with a certificate. Jim Wood, who has worked the lighting at the Lennox Community Theatre for 20 years, was given a lifetime achievement award. The late Ernie Doughty was also named a lifetime achievement recipient, with his wife Mary accepting on his behalf. Isbester noted it was Doughty’s passion for music that earned him the award, as he launched the Napanee District Secondary School music program in 1969. Later in life he was an active member with fundraising for the Lennox and Addington County General Hospital and also wrote the detailed history of LACGH’s first 50 years, as well as the history of the Masonic Lodge, forever preserving its history. Noelle Maracle, a 17-year-old student at NDSS, was named the first ever Student Artist award winner. The Tyendinaga singer recently signed a record with Wax Record, and is currently working on her debut album in Toronto. She got her start on YouTube, where videos of her singing have 26 million views, with 29,000 subscribers. Earlier this year she was featured on the CTV hit show The Launch. “Noelle still contributes regularly in the area and won’t be forgetting her roots,” said Isbester, noting she has sung for residents in retirement homes as well as performing the National Anthem at several of the town’s biggest sporting events. Martin Barstow was named the Arts Educator award recipient. An Art teacher at NDSS since 1989, Barstow also founded writer’s festivals and a creative writing club to help students hone their creative skills. Barry Lovegrove was presented with the Established Artist. A familiar face on the local music scene and volunteer with several fundraisers, Lovegrove was also celebrated for his time in the United Kingdom during the 1960s, when he was a major figure on the emerging rock scene. His band, the JetBlacks, shared the stage with many of the biggest acts of the time. Now a resident of Greater Napanee, he continues to contribute to the arts through his writing, photography and music. LACGH, for their generous use of space for local artists to showcase their work in the Community Corridor, was given the Patron of the Arts award, which was accepted by Michelle Smith. Newburgh residents Stacey Anderson, Dave Anderson and Viola Kalinowski were celebrated as the Outstanding Event award winners for their 13 years of hosting Art Among the Ruins. The show is hosted on her parent’s property, the site of an old mill nestled next to the Napanee River. This past June they welcomed 70 exhibitors with over 2,500 guests.